Home Fitness & Health A Pain in the Neck! It’s happened again – you’ve wakened with a crick in your neck. If it didn’t occur while you were sleeping it likely happened when you were stretching or contorting your head in an atypical manner. It’s that tightness you hate. Sometimes it even makes your head slightly askew – you can’t look anyone straight in the eye because your neck is crooked! Sure, everyone knows that cricks are related to muscle spasms and you’ve likely already indulged in a few extra strength ibuprofen for it. But the truth of the matter is, you’re going to feel like this all day. And that’s not cool. Time to consider a few of the known natural remedies for treating such a pain-in-the-neck! Since scarves keep your neck warm and provide it with extra support, try wearing one as a means of alleviating the pain. And hey, you can actually benefit from it by being a little extra fashionable by donning one of matching style. Also, if it’s winter time, you can break out a few of those old turtle necks. The thicker the material the more support it can potentially provide for your neck. And since the key is to keep the neck warm, you’ll be feeling swell in no time! But obviously, this option won‘t serve you in the warmer months. But there are other options! Speaking of temperatures, oddly enough, alternating them is a cheap way to self-treat. Obviously, you already know to put ice on the pain, but switching to a heat pad can calm your muscles and remove stress from the area. For best results to cure neck pain with heat pad, apply the cold to your neck and shoulders for around twenty minutes, before doing the same with the heat. You’ll likely determine that one is more effective than the other. If so, stick with what feels best. 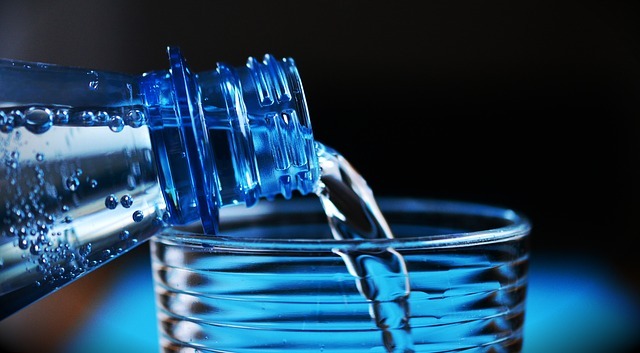 Little known is the fact that neck pain can be brought on by dehydration. Drinking water is necessary and therapeutic, after all. If you’re not drinking the recommended 8 – 10 glasses of it daily you could be making yourself vulnerable to neck pain. Drinking plenty of H2O is, in fact, a preventative measure against cricks. Also best used preventive, exercise is a great way to combat cricks. You may even work-out to resolve the neck pain you suffer from right now. Sure, it hurts just to move your head slightly, but exercise can help. For instance, ‘range-of-motion’ exercises are very effective in this arena, as are certain stretches. Both work specific muscles but be VERY careful, do your stretches slowly and steady. In fact, if the pain isn’t similar to anything that you’ve experienced previously, leave it alone. You could be dealing with some sort of fracture – or worse – and you should seek immediate medical care. You don’t want to exacerbate the matter by causing yourself more pain. Of course, a massage can’t hurt when dealing with cricks. In fact, a certain type of massage known as ‘cupping’ actually uses suction to increase blood flow. It is an effective therapy that promotes healing in specific areas. The funny thing is you really do use cups, made of silicone or glass. It’s a version of the old practice known as ‘dry cupping’ which has been developed in a variety of ways. Of note, other materials used in various cupping treatments include fire and blood! Hopefully one or two of these tips will do the trick. A crick can have a negative influence on your entire day as it is a constant distraction of discomfort. It’s always preferable to seek out remedies that are entirely organic; it just seems too easy to resort to chemicals. If you’ve tried one of these methods and still experience pain after 48 hours, seek the attention of a doctor or physician immediately.